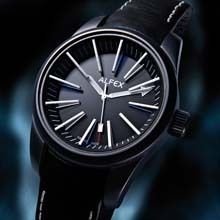 Alfex presents the first wristwatch in the world with a three-dimensional dial. The markings are made of transparent sapphire glass, and the hands travel under the markings. The name Black Light describes the properties that make reading the time by night a sensational experience, thanks to the markings with Superluminova. The name Black Light is an oxymoron, which, in rhetoric, means a formulation of two contrary concepts. This figure of speech is used only if the inner contradiction is intentional and serves to create an emphatic description of a multi-faceted content. The new design piece in the Alfex family is absolutely functional by day as well as by night. Its jet black dial spreads bright light, and its unique three-dimensional design allows the wearer to virtually immerse himself in the watch. The Black Light model is an absolute must for every design addict. All Black Line models bear the Swiss-Made label, are constructed of anti-allergenic stainless steel with an ETA movement of precious stones. In addition, the case has an anti-reflexive sapphire glass and is waterproof to 5 ATM. Black Line models are available in select stores in two versions: steel case with integrated black leather watchband, and case with black IP cover and integrated black leather watchband.